F.H. Peacock & Co. Ford dealers in Kent. Homepage. This page: An invoice for work done to a pre-war Ford car, in Kent, during 1933. F.H. Peacock and Co. for Ford cars. F.H. Peacock and Co. was situated on the Foord Road in Folkestone, and appropriated enough was an authorised Ford dealer & garage. 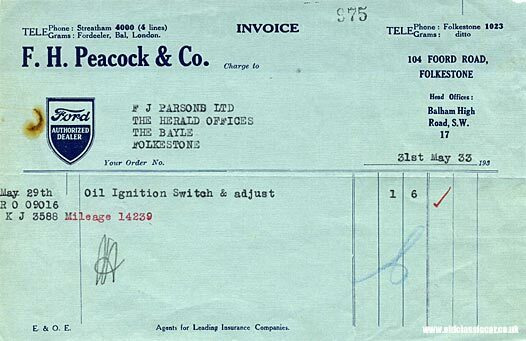 This invoice was issued to F.J. Parsons Ltd of the same town, in May 1933, for some minor work done to a Ford. In fact all they did was lubricate and adjust the car's ignition switch, for which the customer was charged 1s 6d. The company's head office was in Balham, London, so it was quite a large operation in the South East of England in the 1930s. Handily there is a mention of the Ford's registration number: KJ 3588. KJ was a Kent registration series that ran from March 1931, through to November 1932 only. The car's mileage was only 14,239 so this tallies with a car, or perhaps a company van, being used for a year or so by this point. If the car was indeed built in 1932, chances are it was a Ford Model Y, as the 8hp Model Y made its debut in that year. The 5cwt Model Y van also made its entrance in the same year. It seems the firm began trading in 1908 from the Balham garage, and Peacock's were still selling Fords some 75+ years later. More interesting old items of motoring paperwork can be found in the Motoring Collectables section. Amongst them is a small collection of items relating to Ford and Fordson dealer W.J. Reynolds of East Ham, London.